My wife and I recently took a 3 day weekend in the Great Northwoods for some well deserved downtime. We rented a newly remodeled vacation property from Adventure Rentals in Eagle River and the location couldn't have been more perfect! Our criteria for the weekend was to find someplace remote with a hot tub, sauna and of course, wildlife to enjoy and photograph. This property advertised the first three criteria and mother nature provided the rest. Located on a secluded lot right on the Wisconsin River, my wife and I were treated with a pair of nesting bald eagles right across the still frozen river. The fact that we were so near their home meant that we got to enjoy watching them take turns flying off the nest as they went off in search of food. When they weren't off hunting, one of the pair was usually spotted sitting close by waiting for the call to relieve its mate from nesting duties. March weather in Wisconsin is always a crap shoot. The first day we had overcast skies, occasional flurries and below freezing temps with a howling wind racing up the river. It didn't stop us from spending some quality time overlooking the river and watching the eagles and other wildlife though. We were located about 25 feet above the river with a pretty steep embankment leading down to the mostly frozen water. The only visible open water was right at the bottom of that embankment. 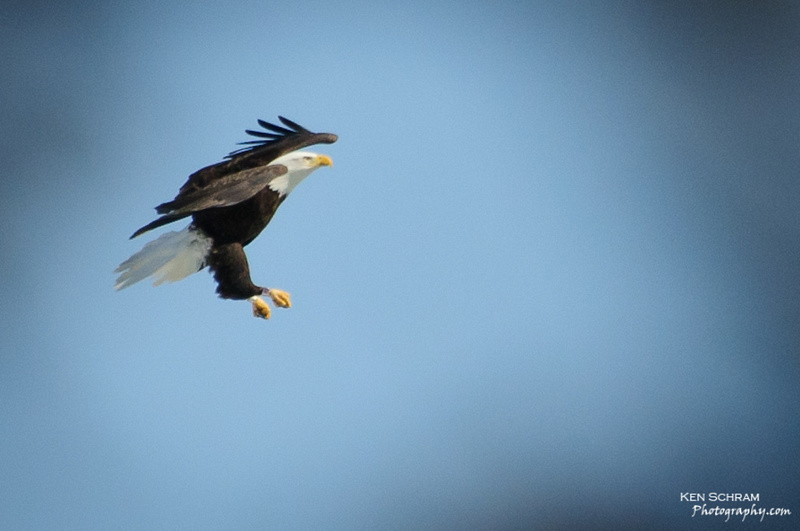 My wife and I happened to spot a bald eagle circling over the river from inside the house so I decided to grab the camera and sneak on out for some more photos. With as much stealth as my 2 left feet can carry my inconspicuous 6'1 frame, I made my way out to the edge of the embankment trying to locate where our feathered friend came to rest. As it happened, the eagle was taking a bath in the open water at the bottom of the hill less than 30 feet away! The following image is a testament to my stalking abilities and my lightning fast reflexes when compared to that of these magnificent birds. Nice tail feathers, huh? :o). He/she made a lap around the river and came to rest in one of the preferred perches a few trees down from the nest to dry off from the quick, icy bath that I so rudely interrupted. That evening, my wife and I beat the cold by enjoying both the outdoor sauna and hot tub on the deck overlooking the river while the eagles watched on from the trees above. It wouldn't take much to get used to that! Day two brought a little nicer weather. The temp eventually broke 40 degrees and the sun made an appearance to brighten things up some as well. Our feathered friends and a few relatives where enjoying the nicer weather as well. 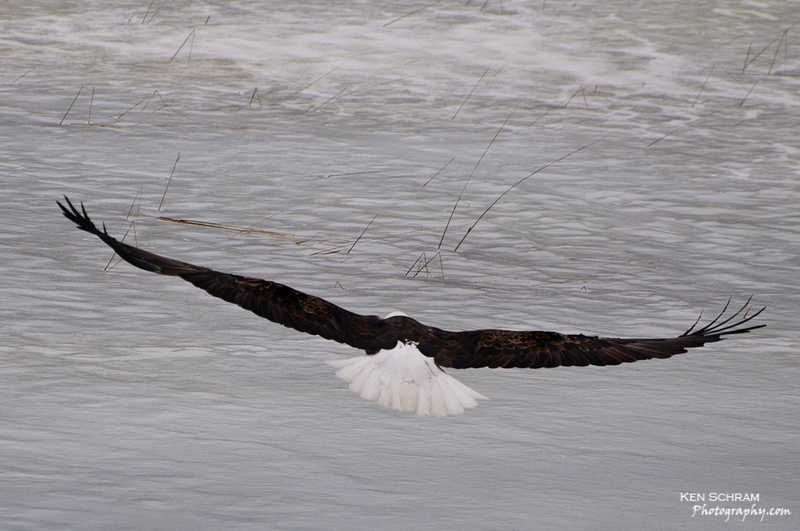 I shot this one between a few branches as the eagle came in to land on a tree on our side of the river. Notice the leg bands shining in the sun. What I wouldn't give to know the story behind those bands! 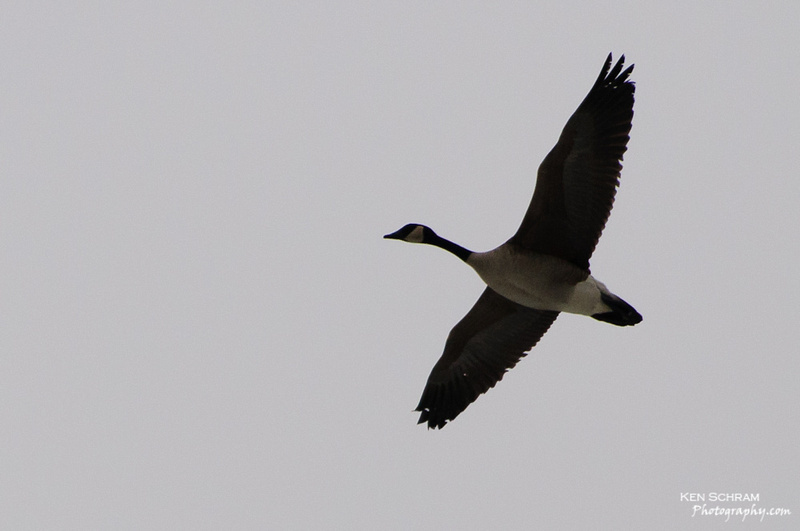 Was this a formerly injured and released bird? It's mate wore no such bands. 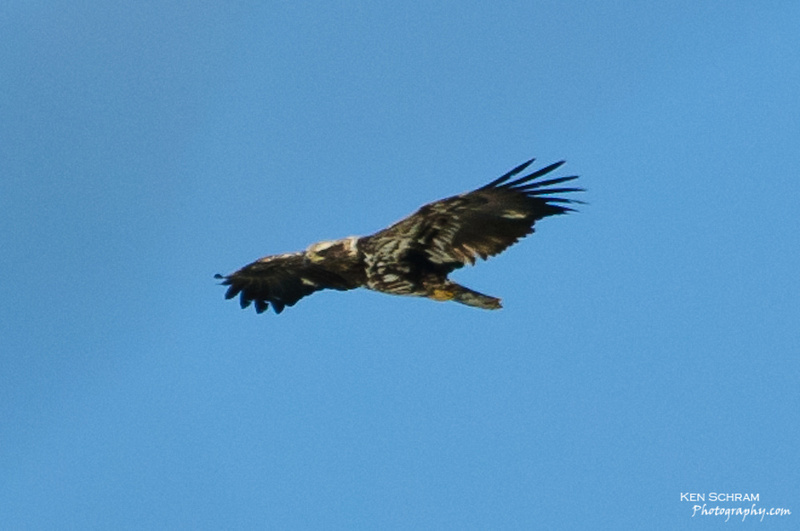 Here's a shot of a juvenile bald eagle soaring high overhead. Just as big as the nesting pair, this guy/gal is still working on the white plumage which won't appear until sexual maturity at approximately 4 or 5 years of age. If you are a bald eagle of sexually mature age, you build a little love nest for you and the little lady. These "little" love nests can be up to 9 feet across, 13 feet deep and weigh up to 1 TON! 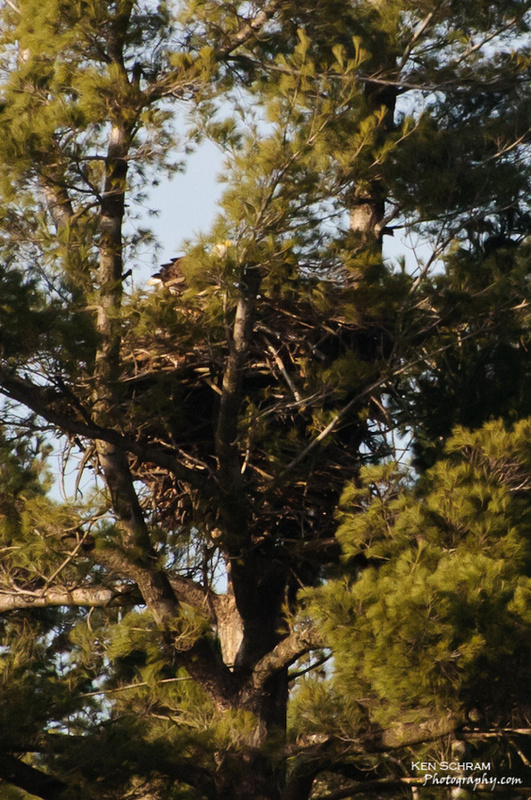 You can see part of one of the eagles on the back left corner of the nest about to trade places with its mate. Of course there was other wildlife on the scene as well. 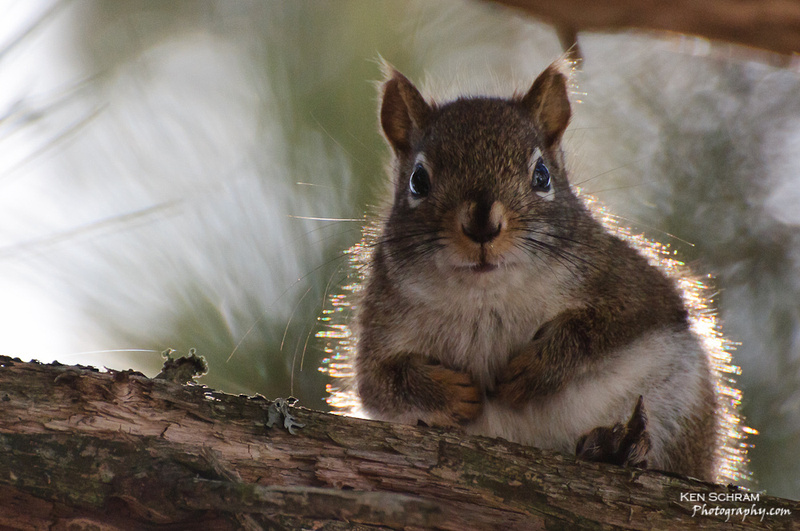 This red squirrel kept yelling at me to take his picture until finally I caved in. Or maybe I was too close to his "secret stash". Who knows? This fisher appeared out of nowhere skirting the open edge of the river. He didn't seem to mind me in the least as he stopped and gave me the once over a few times. He did appear to be a little apprehensive of the bald eagle sitting in the top of a pine on the other side of the river though. After this glance over the shoulder, he picked up the pace and disappeared just as quickly as he had come on to the scene. On our third and final morning we awoke to several inches of fresh snow and slush to drive home in. Good ol' Wisconsin weather for you. All in all, it was an amazing weekend. The location was incredible, the amenities of the rental outstanding and the photo opportunities memorable to say the least. My wife and I both agree that we will be back for another helping. If this sounds like something you would enjoy, I STRONGLY encourage you to contact Adventure Rentals. We've had the pleasure of enjoying two of their properties and they've gone out of their way to make our stay as enjoyable as possible both times. 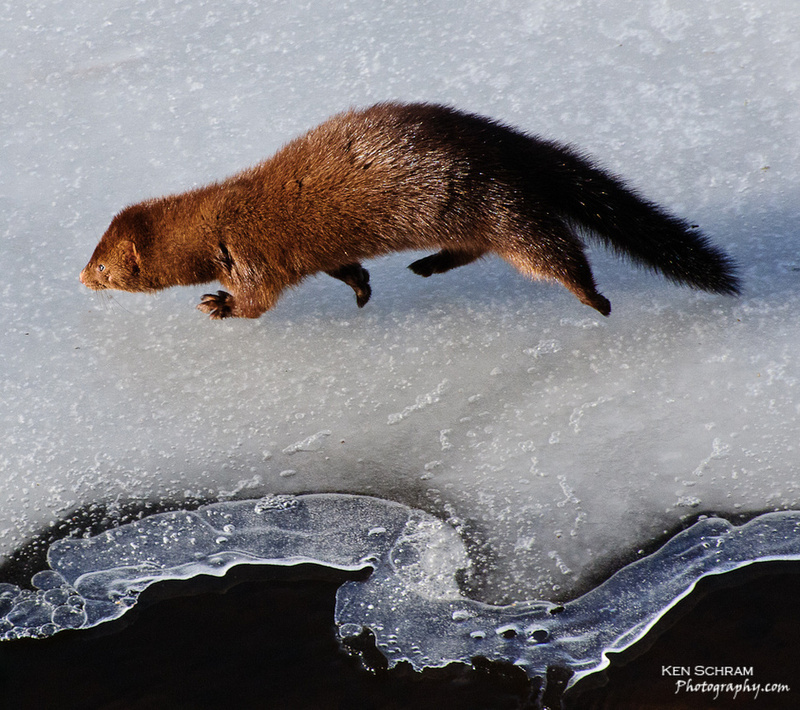 Great montage, I like the Fisher and ice - great composition and light. 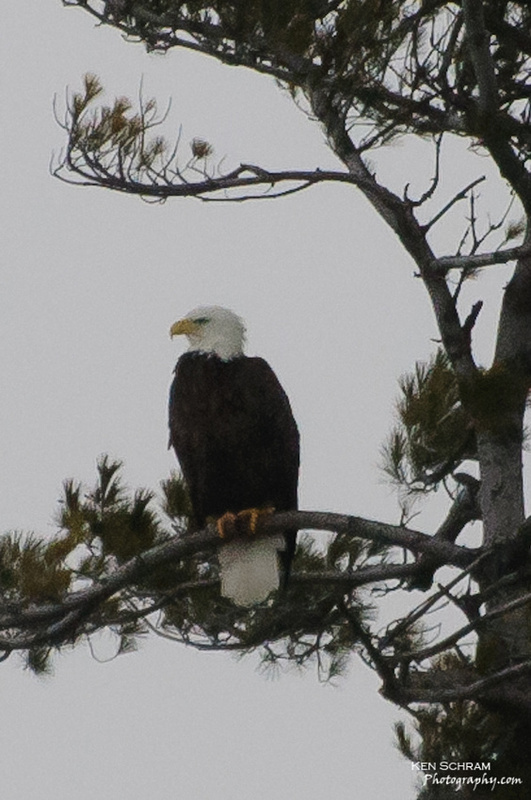 The eagle shots are great - did u talk with the rental folks about advertisement value of these? Thanks, Mark. We really enjoyed our time there and will definately go back. I did send a note to Adventure Rentals as well. Thanks for commenting. Wow! These are amazing pictures Ken. You have some talent! Thank you for giving me the link to see them and I'm glad you liked the house.